Golden Special Pie set a new track record at the Central Wyoming Fairground on Saturday while winning the I-80 Futurity. CASPER, WY�SEPTEMBER 19, 2015�Golden Special Pie went wire-to-wire in a track record performance to score her first career win on Saturday. The daughter of leading sire IVORY JAMES held off her stablemate Keysas Si by a neck to win the $20,000 I-80 Futurity final at the Central Wyoming Fairground in Casper. Jess My Apollo finished a neck off the leaders in third place. Ridden by jockey Juan Pulido, Golden Special Pie completed the 300-yard task in a quick :15.345 seconds to earn a 107-speed index. The previous track record of :15.420 were established 31-years-ago by Windy World on August 26, 1984. Trainer Jorge Nava saddled the winner for owner/breeder Ruben Chavez. 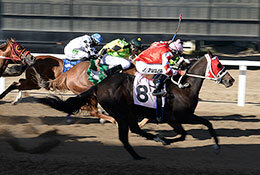 The $8,000 winner's purse boosted the filly's record to (5) 1-2-1 with earnings of $11,225. Golden Special Pie was bred in Colorado from the Pie In The Sky mare Sheza Special Pie. Also a Colorado-bred Keysas Si races for owner/breeder Fidel Roybal. Daniel Valles had the riding assignment for trainer Jorge Nava. She earned $4,400. Jess My Apollo races for Ralph Young and trainer Mike Taylor. D. Leonard and Rada Rogers bred the bay . Ridden by Clyde Smith, the bay earned $2,600 for her effort. Timeless Hope, Favorite Hat, Brooks Big Boy, Hes A Corona Bay and Tsunami Jack completed the field.